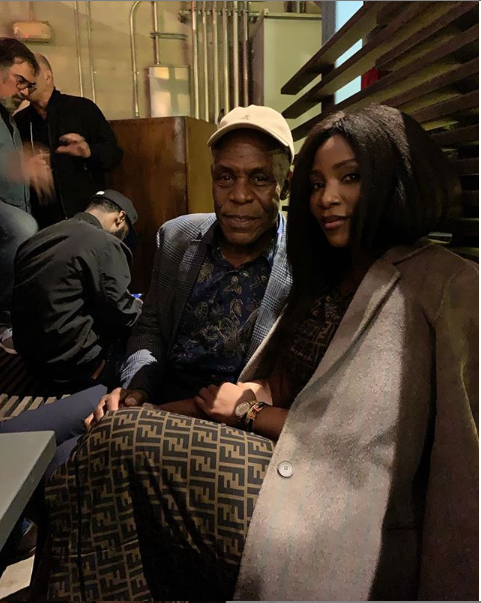 Queen of Nollywood Genevieve Nnaji is in Los Angeles for The Bail Project with other Hollywood celebrities and personalities. With her directorial debut Lionheart arriving Netflix last month and thus penetrating America, and signing onto a talent agency that represents Angelina Jolie and Johnny Depp, Nnaji is on the global stage. The aforementioned event had the actress pictured with ace Hollywood actor, director and political activist Danny Glover (Sorry To Bother You, Lethal Weapon, The Colour Purple). And we love it. Nnaji looks laidback and chic wearing a suit draped over a Fendi dress and her geriatric fan Glover leans close with a face cap. The Bail Project is a non-government organisation set up to combat America’s mass incarceration problem through a revolving national bail fund, to secure freedom for as many inmates as possible. On any given night in America, there are 450,000 people locked up in jails simply because they can’t afford bail. They pay bail for people in need, reuniting families and restoring the presumption of innocence. Because bail is returned at the end of a case, donations to The Bail Project can be recycled and reused to pay bail two to three times per year, maximizing the impact of every dollar. 100% of online donations are used to bring people home. That said, we hope Nnaji can use her renewed celebrity influence for some social good in her native country. Charity, they say, begins at home.